Rites of Passage are rituals marking moments in our lives where our lives go thru a transformation. There are several kind of rites of passage: life cycle changes, secular changes, religious vocational changes. 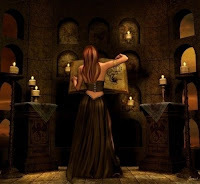 Develop an appreciation for personal rites of passage and those of other cultures and religions, namely Wicca . Understand and explain Arnold Van Gennep’s and Victor Turner’s stages of Rites of Passage as illustrated through examples from the students’ own personal experiences. Compare and contrast rites to see if they fit the three-stage model, then interpret, discuss, debate experiences and ideas about rites, categorize them as religious or secular. Lastly, consider how to create a rite of passage, how to design the ritual for marking the transformation in someone's life.